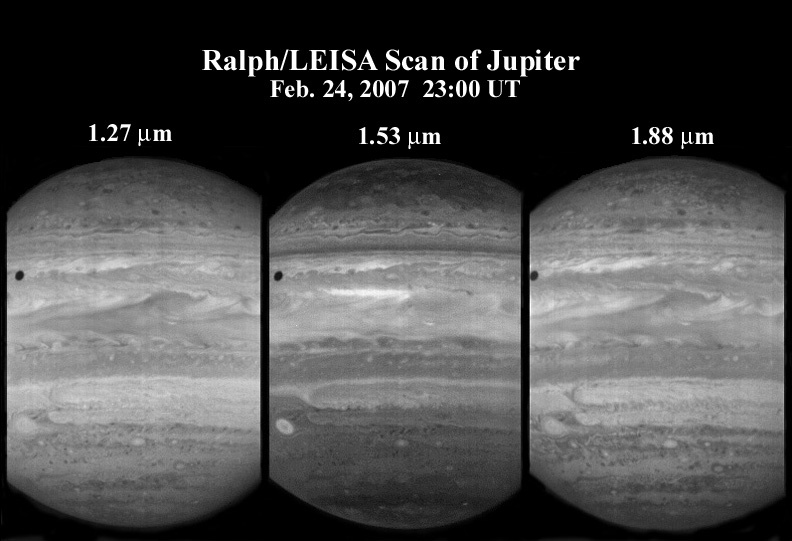 On February 24, 2007, the LEISA (pronounced "Leesa") infrared spectral imager in the New Horizons Ralph instrument observed giant Jupiter in 250 narrow spectral channels. At the time the spacecraft was 6 million kilometers (nearly 4 million miles) from Jupiter; at that range, the LEISA imager can resolve structures about 400 kilometers (250 miles) across. That may seem large, mission scientists say, but Jupiter itself is more than 144,000 kilometers (89,000 miles) across. "The detail revealed in these images is simply stunning," says Dr. Dennis Reuter, Ralph/LEISA project scientist and a New Horizons co-investigator from NASA's Goddard Space Flight Center in Greenbelt, Md. "Our instrument is performing spectacularly well." LEISA observes in 250 infrared wavelengths, which range from 1.25 micrometers (�m) to 2.50 �m. The three images shown above from that dataset are at wavelengths of 1.27 �m (left), 1.53 �m (center) and 1.88 �m (right). The bright areas in the image frames are caused by solar radiation reflected from clouds and hazes in Jupiter's atmosphere. Dark areas correspond to atmospheric regions where solar radiation is absorbed before it can be reflected. The dark circular feature in the upper left of all three images is the shadow of Jupiter's innermost large moon, Io. Light at 1.53 �m (center frame) comes from relatively high in the atmosphere. The other two channels probe deeper atmospheric levels. Features that are bright in all three pictures come from high-altitude clouds. Features that are bright in the 1.27 and 1.88 �m channels, but darker in the 1.53-�m channel come from lower clouds. For example, there is an isolated circular feature (the "Little Red Spot") in the lower left of the 1.53-�m image. In the 1.27 and 1.88 �m data, this circular feature is surrounded by other structures. The implication is that the "Little Red Spot" is caused by a system that extends far up into the atmosphere, while other structures are lower. "The three frames shown here are just a sampling of what LEISA returned in this dataset," says Dr. Don Jennings, LEISA principal investigator and a New Horizons co-investigator from NASA Goddard. "Combining data from all 250 channels will allow us to make detailed three-dimensional maps of the composition and circulation of the Jovian atmosphere." At closest approach to Jupiter on February 28, at a distance of about 2.5 million kilometers (1.4 million miles), LEISA's resolution was about three times better than it was on February 24. LEISA images made at that far-better resolution are still stored in the spacecraft's data recorder, awaiting downlink from New Horizons.